Applications: World has tested Sportsman-II heads in many applications including 375Hp 9:1 street engines; 450HP 9.8:1 street /strip engines; all the way to 940HP blown alcohol drag race engines. Typical Application Street: 274 Cam: 230/236° .487''/.490'', Dart II Sportsman #955-061010 dual plane intake; 750 cfm carb, 1-3/4'' header. 430HP on 9.8:1 355; 480HP on 383 10.5:1 (varies with displacement and compression ratio). Typical Application Drag Race: Modified 750 cfm carb, 276/284° roller cam, single plane plenum intake, 1-3/4''-plus header. MUST Upgrade to 1.550'' roller valve springs and 10° hardware. Up to 650HP normally aspirated depending on displacement and CR and porting. Puhshrods: Requires heat-treated pushrods. Use of 1.6 ratio rocker arms require elongation of pushrod holes. NOTE:These specifications are for reference only. ALWAYS measure before machining. The Easiest Way to Bolt On 30-70HP! Continuously improved since it's 1987 introduction, the World Products Sportsman II is still the industry's most popular cast iron high performance head. Featuring RightCast 200cc intake runners, Fast-Burn chambers and your choice of angled or straight plugs, they're good for 30-70 HP increases right out of the box. 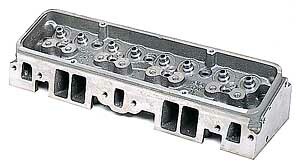 They are the aftermarket's only 50-state emissions legal cast iron high performance cylinder head (EO #D-343-1). You should also know that all World Products heads are precision CNC-machined, and indexed off the chambers to assure perfect alignment with the cylinders. Only World offers complete assemblies with Erson stainless steel valves and other quality components including springs, retainers and keepers. Included In Assembly: Erson stainless steel valves, ring and band-style seals, valve springs, Erson 7° chrome moly retainers, and keepers. Pushrods: Requires heat-treated pushrods. Use of 1.6 ratio rocker arms requires elongation of pushrod holes. Note: Specs are for reference only. ALWAYS measure before machining.